For Fall 2014, Miuccia Prada was inspired Rainer Werner Fassbinder’s 1972 classic The Bitter Tears of Petra von Kant. A year and five seasons later, Roksanda Illincic, in London, was inspired by the same film. 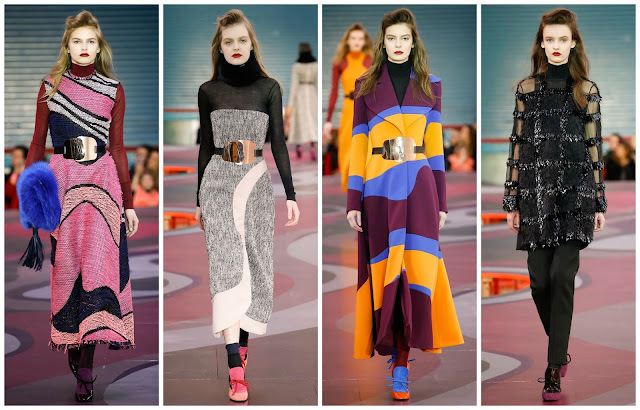 The psychological drama—which is like this years Carol on crack—made for a spectacular Prada show last year so I was highly anticipating Roksanda’s take on the film. The results were sublime. Firstly, she had the Seymour Leisure Centre’s sports hall as her venue. A raised platform designed by set designer Gary Card. Secondly, and most importantly, the clothes were splendid. If you’re a long-time reader of this blog, you might know that each season I like to reference "Joseph’s technicolour dream coat", or components of that sentence. Peter Pilotto for Spring 2015, Altuzarra for Fall 2014. I think it’s time I lend that line to Roksanda’s collection. Her hyper-coloured technicolour coats were, in fact, dreamy. The intarsia fox, rabbit and mink coats were absolutely stunning. These will surely spark outrage from animal rights organisations. Also, the hefty price tag of $25,500 makes the coat unattainable to most. Look 21 was a wool-cady burgundy one shoulder jumpsuit. Underneath was a tangerine long sleeve wool sweater with a rust-coloured neckline. The styling of the show was genius. Purple with mustard to create a rich contrast. A rose-gold reflective belt to cinch the waist and accentuate the models’ figure. The follow look was a burgundy, cobalt and orche mid-weight wool-cady coat. A silk burgundy top with a mustard neckline was paired with a marigold halter dress. Following that look, the collection took a turn into the unknown. Geometric brocade adorned wool-cady outfits. The collection proceeded to finish with a slew of black embellished brocade. Compared to the previous looks, these were mediocre. Gorgeous, but lacking in substance compared to the rest of the collection. Roksanda had a swirling-print raised catwalk. A theatric one might say. Not to compete with the gargantuan sets of Chanel and Tommy Hilfiger. It was more of a statement piece than a theatric. It didn’t detract from the beautiful clothes, bursting with colour and full of vitality.